My object here is to write about the Clean & Jerk with dumbells and an exercise routine I discovered a number of years ago. The Clean & Jerk with dumbells was a favorite lift of mine while I was more actively engaged in weightlifting than I am at present. In 1926, at a bodyweight barely 140 lbs. and a height of 5’11”, I succeeded in establishing an American amateur record of 160 lbs. (80 lb. dumbell in each hand). I am sure I could have raised an 85 lb. dumbell in each hand but had used up my three attempts which was the rule at that time. On many occasions thereafter I lifted a pair of 85 lb. 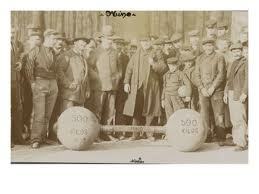 dumbells and a few times succeeded with a pair of 90 pounders. This may not seem much when we consider the terrific poundages some of the boys are lifting at present but we had different standards then – I remember being in Sig Klein’s gym, not the present establishment but the one he was quartered in previously, and he took great delight in showing off the adagio dancer, Bill Raisch, cleaning and jerking with two hands, a 250 lb. barbell. Speaking of Klein, and digressing (which is a writer’s sin), I wonder if he is noted among other for his memory; I walked into his gym one Saturday morning, in September 1944, and he quickly recognized me, shook hands and said, “Leo, by golly I have not seen you for fifteen years.” The last time I had spoken to him was 15 years to the month – September 1929 – and in the interim I had no connections or correspondence with him to keep his memory refreshed. I hope I don’t sound like a venerable ancient on a memory jog. I am 41 years of age and I feel confident that with the proper inducement, if for no other reason than to prove the lasting value of weightlifting and exercising, in about three months I could reach a Clean & Jerk with dumbells of 85 lbs. in each hand. It is my belief that the lift is a good all around muscle developer and creates real strength of lasting qualities. Here is what I discovered. Having lived a fairly busy life with more irons in the fire than one man should have, I have had the misfortune to have my weight training interrupted at various times. Upon starting in again I always noticed that a lift such as the barbell clean and jerk had to be started again at a poundage far below my best lift, but the dumbells clean and jerk could be taken up at a poundage only slightly below my record best. That is why I make the claim that the lift builds strength of the lasting quality. Every lifter should go on a dumbell training program. Our favorite lifts and exercises while training on the two dumbells Clean & Jerk were: two dumbells press standing, two dumbells press on back, and I used to do the wrestler’s bridge, pull over and press with dumbells. My training partner, John Valentine, the Michigan Hercules, a short and muscularly impressive lifter with 17” upper arms who had very little lifting science but great strength and reserves of energy and vitality, would press my limit jerk poundages with the dumbells and then would do repetition jerks with a pair of one hundred pounders. Another favorite training stunt was to walk around the gym with a heavy dumbell in each hand held at the “hang” position. John could walk up a flight of stairs and back, with a pair of 150 pounders that had 1¼” grips. 1) Both dumbells were cleaned to the shoulders. 2) Right hand dumbell was jerked to arm’s length and returned to shoulder. 3) Left hand dumbell was jerked to arm’s length and returned to shoulder. 4) Right hand dumbell was jerked to arm’s length and left hand dumbell was jerked to arm’s length, then both returned to shoulders. 5) Left hand dumbell was jerked to arm’s length and right hand dumbell was jerked to arm’s length, then both returned to shoulders. 6) Both dumbells jerked to arms’ length, returned to shoulders and back to the floor. This is a rugged routine. Bear in mind that in numbers 2) and 3), one dumbell is jerked to arm’s length while the other is held at the shoulder. In numbers 4) and 5), the same procedure takes place with the addition of jerking a dumbell to arm’s length while the other is held at arm’s length overhead. Some really terrific poundages have been raised in the dumbells jerk. Arthur Saxon, at a bodyweight of 207 lbs., in London, cleaned and jerked with dumbells, 288 lbs. (1905). Cadine and Rigoulot used the dumbells jerk as one of the lifts in their match. At a bodyweight of 216 lbs., Rigoulot cleaned and jerked 229.75 lbs. At a bodyweight of 198 lbs., Cadine surpassed him on this lift by cleaning and jerking 253 lbs. As a matter of contrast, Rigoulot jerked on a barbell, in this same match, 43 lbs. more than Cadine. Maurice Deriaz, the Swiss lifter, one of a group of brothers famous in strength history who gained most of their fame in France, at a bodyweight of 200 lbs., continentalled and jerked 288 lbs. and he is reputed to have continentalled 308 lbs. Wilhelm Turk, at a bodyweight of 264 lbs., continentalled and jerked 325 lbs. with dumbells. Josef Grafl, at a bodyweight of 247 lbs., has left us to ponder and marvel at a simple amazing lift of 341 lbs. continental jerk with dumbells.